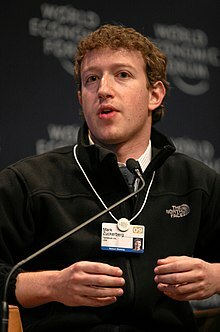 Mark Elliot Zuckerberg (born May 14, 1984) is an American computer programmer and Internet entrepreneur. He is the chairman, chief executive officer, and co-founder of Facebook.His net worth is estimated to be US$58.6 billion as of March 2017, ranking him the fifth richest person in the world. In December 2012, Zuckerberg and his wife Priscilla Chan announced that over the course of their lives they would give the majority of their wealth to “advancing human potential and promoting equality” in the spirit of The Giving Pledge. On December 1, 2015, they announced they would eventually give 99 percent of their Facebook shares (worth about US$45 billion at the time) to the Chan Zuckerberg Initiative. Since 2010, Time magazine has named Zuckerberg among the 100 wealthiest and most influential people in the world as a part of its Person of the Year award. In December 2016, Zuckerberg was ranked 10th on Forbes list of The World’s Most Powerful People. According to Forbes Magazine, Zuckerberg has a net worth of US$55.9 billion as of February 2017. Zuckerberg was born in 1984 in White Plains, New York. He is the son of Karen (Kempner), a psychiatrist, and Edward Zuckerberg, a dentist. His ancestors came from Germany, Austria and Poland. He and his three sisters, Randi, Donna, and Arielle, were brought up in Dobbs Ferry, New York, a small Westchester County village about 21 miles north of Midtown Manhattan. Zuckerberg was raised Jewish and had his bar mitzvah when he turned 13. At Ardsley High School, Zuckerberg excelled in classes. He transferred to the exclusive private school Phillips Exeter Academy, in New Hampshire, in his junior year, where he won prizes in science (math, astronomy, and physics) and classical studies. On his college application, Zuckerberg claimed that he could read and write French, Hebrew, Latin, and ancient Greek. He was captain of the fencing team. Zuckerberg began using computers and writing software in middle school. His father taught him Atari BASIC Programming in the 1990s, and later hired software developer David Newman to tutor him privately. Newman calls him a “prodigy“, adding that it was “tough to stay ahead of him”. 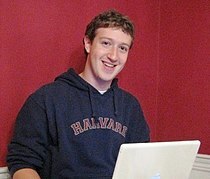 Zuckerberg took a graduate course in the subject at Mercy College near his home while still in high school. He enjoyed developing computer programs, especially communication tools and games. In one program, since his father’s dental practice was operated from their home, he built a software program he called “ZuckNet” that allowed all the computers between the house and dental office to communicate with each other. It is considered a “primitive” version of AOL‘s Instant Messenger, which came out the following year. During Zuckerberg’s high school years, he worked under the company name Intelligent Media Group to build a music player called the Synapse Media Player. The device used machine learning to learn the user’s listening habits, which was posted to Slashdot and received a rating of 3 out of 5 from PC Magazine. In a 2011 interview with PBS shortly after the death of Steve Jobs, Zuckerberg said that Jobs had advised him on how to create a management team at Facebook that was “focused on building as high quality and good things as you are”. A month after Zuckerberg launched Facebook in February 2004, i2hub, another campus-only service, created by Wayne Chang, was launched. i2hub focused on peer-to-peer file sharing. 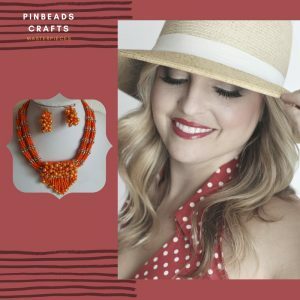 At the time, both i2hub and Facebook were gaining the attention of the press and growing rapidly in users and publicity. In August 2004, Zuckerberg, Andrew McCollum, Adam D’Angelo, and Sean Parker launched a competing peer-to-peer file sharing service called Wirehog, a precursor to Facebook Platform applications. In 2007, Zuckerberg was named by the Massachusetts Institute of Technology (MIT) Technology Review‘s TR35 as one of the top 35 innovators in the world under the age of 35. On July 23, 2008, Zuckerberg announced Facebook Connect, a version of Facebook Platform for users. The world economy is going through a massive transition right now. 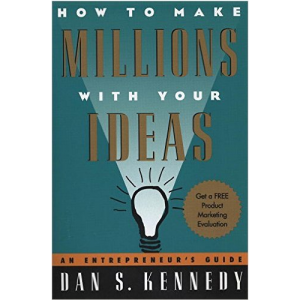 The knowledge economy is the future. By bringing everyone online, we’ll not only improve billions of lives, but we’ll also improve our own as we benefit from the ideas and productivity they contribute to the world. Giving everyone the opportunity to connect is the foundation for enabling the knowledge economy. It is not the only thing we need to do, but it’s a fundamental and necessary step. To stay proven on the efforts of bringing in the concept of net neutrality, Mark Zuckerberg met Narendra Modi, Satya Nadella and Sundar Pichai at the Silicon Valley, to discuss on how to effectively establish affordable internet access to the less developed countries. As a token of initiation, Mark Zuckerberg changed his Facebook profile picture to extend his support to the Digital India to help the rural communities to stay connected to the internet. In November 2007, confidential court documents were posted on the website of 02138, a magazine that catered to Harvard alumni. They included Zuckerberg’s Social Security number, his parents’ home address, and his girlfriend’s address. Facebook filed to have the documents removed, but the judge ruled in favor of 02138. A lawsuit filed by Eduardo Saverin against Facebook and Zuckerberg was settled out of court. Though terms of the settlement were sealed, the company affirmed Saverin’s title as co-founder of Facebook. Saverin signed a non-disclosure contract after the settlement. In June 2010, Pakistani Deputy Attorney General Muhammad Azhar Sidiqque launched a criminal investigation into Zuckerberg and Facebook co-founders Dustin Moskovitz and Chris Hughes after a “Draw Muhammad” contest was hosted on Facebook. The investigation named the anonymous German woman who created the contest. Sidiqque asked the country’s police to contact Interpol to have Zuckerberg and the three others arrested for blasphemy. On May 19, 2010, Facebook’s website was temporarily blocked in Pakistan until Facebook removed the contest from its website at the end of May. Sidiqque also asked its UN representative to raise the issue with the United Nations General Assembly. In June 2010, Paul Ceglia, the owner of a wood pellet fuel company in Allegany County, upstate New York, filed suit against Zuckerberg, claiming 84 percent ownership of Facebook and seeking monetary damages. 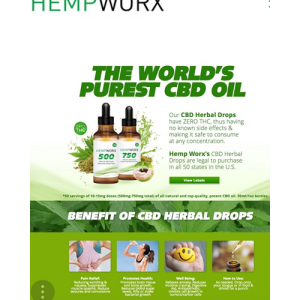 According to Ceglia, he and Zuckerberg signed a contract on April 28, 2003, that an initial fee of $1,000 entitled Ceglia to 50% of the website’s revenue, as well as an additional 1% interest in the business per day after January 1, 2004, until website completion. Zuckerberg was developing other projects at the time, among which was Facemash, the predecessor of Facebook, but did not register the domain name thefacebook.com until January 1, 2004. Facebook management dismissed the lawsuit as “completely frivolous”. Facebook spokesman Barry Schnitt told a reporter that Ceglia’s counsel had unsuccessfully sought an out-of-court settlement. On October 26, 2012, federal authorities arrested Ceglia, charging him with mail and wire fraud and of “tampering with, destroying and fabricating evidence in a scheme to defraud the Facebook founder of billions of dollars.” Ceglia is accused of fabricating emails to make it appear that he and Zuckerberg discussed details about an early version of Facebook, although after examining their emails, investigators found there was no mention of Facebook in them. Some law firms withdrew from the case before it was initiated and others after Ceglia’s arrest. On July 2, 2016, Israeli cabinet minister Gilad Erdan accused Zuckerberg of having some responsibility for deadly attacks by Palestinians against Israelis. According to him, the social network was not doing enough to ban posts to its platform that incite violence against Israelis. “Some of the victims’ blood is on Zuckerberg’s hands”, Erdan said. In January 2017, Zuckerberg filed eight “quiet title and partition” lawsuits against hundreds of native Hawaiians to get them to sell their land to him. This land is contained within the 700 acres of land in the Hawaiian island of Kauai that Zuckerberg had purchased in 2014. When he learned that Hawaiian land ownership law differs from that of the other 49 states, he dropped the lawsuits. According to David Kirkpatrick, former technology editor at Fortune magazine and author of The Facebook Effect:The Inside Story of the Company That Is Connecting the World, (2011), “the film is only “40% true … he is not snide and sarcastic in a cruel way, the way Zuckerberg is played in the movie.” He says that “a lot of the factual incidents are accurate, but many are distorted and the overall impression is false”, and concludes that primarily “his motivations were to try and come up with a new way to share information on the internet”. Although the film portrays Zuckerberg’s creation of Facebook in order to elevate his stature after not getting into any of the elite final clubs at Harvard, Zuckerberg himself said he had no interest in joining the clubs. Kirkpatrick agrees that the impression implied by the film is “false”. Karel Baloun, a former senior engineer at Facebook, notes that the “image of Zuckerberg as a socially inept nerd is overstated….. It is fiction…..” He likewise dismisses the film’s assertion that he “would deliberately betray a friend”. Zuckerberg voiced himself on an episode of The Simpsons titled “Loan-a Lisa“, which first aired on October 3, 2010. In the episode, Lisa Simpson and her friend Nelson encounter Zuckerberg at an entrepreneurs’ convention. Zuckerberg tells Lisa that she does not need to graduate from college to be wildly successful, referencing Bill Gates and Richard Branson as examples. Stephen Colbert awarded a “Medal of Fear” to Zuckerberg at the Rally to Restore Sanity and/or Fear on October 30, 2010, “because he values his privacy much more than he values yours”. Zuckerberg created an account with Google+ soon after the social network was unveiled, saying he sees it as a “validation for his vision” of online social networking. By July 2011, Zuckerberg had become the most followed user on Google+, outranking Google co-founders Larry Page and Sergey Brin. As of March 6, 2012, his ranking has dropped to 184 on the service, behind Page and Brin. His public profile is minimal with one photo and a bio that reads “I make things”. Zuckerberg has maintained a private account on Twitter under the username “zuck”, although as of November 2014, the account’s status is suspended. In 2009, he revealed that the public account “finkd” also belonged to him. Zuckerberg donated an undisclosed amount to Diaspora, an open-source personal web server that implements a distributed social networking service. He called it a “cool idea”. Zuckerberg founded the Start-up: Education foundation. On September 22, 2010, it was reported that Zuckerberg had donated $100 million to Newark Public Schools, the public school system of Newark, New Jersey. Critics noted the timing of the donation as being close to the release of The Social Network, which painted a somewhat negative portrait of Zuckerberg. Zuckerberg responded to the criticism, saying, “The thing that I was most sensitive about with the movie timing was, I didn’t want the press about The Social Network movie to get conflated with the Newark project. I was thinking about doing this anonymously just so that the two things could be kept separate.” Newark Mayor Cory A. Booker stated that he and New Jersey Governor Chris Christie had to convince Zuckerberg’s team not to make the donation anonymously. The money was largely wasted, according to journalist Dale Russakoff. On December 9, 2010, Zuckerberg, Bill Gates, and investor Warren Buffett signed “The Giving Pledge “, in which they promised to donate to charity at least half of their wealth over the course of time, and invited others among the wealthy to donate 50 percent or more of their wealth to charity. On December 19, 2013, Zuckerberg announced a donation of 18 million Facebook shares to the Silicon Valley Community Foundation, to be executed by the end of the month—based on Facebook’s valuation as of then, the shares totaled $990 million in value. On December 31, 2013, the donation was recognized as the largest charitable gift on public record for 2013. The Chronicle of Philanthropy placed Zuckerberg and his wife at the top of the magazine’s annual list of 50 most generous Americans for 2013, having donated roughly $1 billion to charity. In October 2014, Zuckerberg and his wife Priscilla Chan donated US$25 million to combat the ebola virus disease, specifically the ebola virus epidemic in West Africa. On December 1, 2015, Zuckerberg and Chan announced the birth of their daughter Max, and in an open letter to Max, they pledged to donate 99 percent of their Facebook shares, then valued at US$45 billion, to the Chan Zuckerberg Initiative, their new organization that will focus on health and education. The donation will not be given immediately, but over the course of their lives. However, instead of forming a charitable corporation to donate the value of the stock to, as Bill Gates, Warren Buffett, Larry Page, Sergey Brin and other tech billionaires have done, Zuckerberg and Chan chose to use the structure of a limited liability company. This has drawn criticism from a number of journalists. In 2002, Zuckerberg registered to vote in Westchester County, New York, where he grew up, but did not cast a ballot until November 2008. Santa Clara County Registrar of Voters Spokeswoman, Elma Rosas, told Bloomberg that Zuckerberg is listed as “no preference” on voter rolls, and he voted in the past two general elections, in 2008 and 2012. On Zuckerberg’s Facebook page, he has Chris Christie, Cory Booker, Nicolas Sarkozy, and Barack Obama in his likes section. Zuckerberg has never revealed his own political views: some consider him a conservative, while others consider him liberal. On February 13, 2013, Zuckerberg hosted his first ever fundraising event for New Jersey Governor Chris Christie. Zuckerberg’s particular interest on this occasion was education reform, and Christie’s education reform work focused on teachers unions and the expansion of charter schools. Later that year, Zuckerberg hosted a campaign fundraiser for Newark mayor Cory Booker, who was running in the 2013 New Jersey special Senate election. In September 2010, with the support of Governor Chris Christie, Booker obtained a US$100 million pledge from Zuckerberg to Newark Public Schools. In December 2012, Zuckerberg donated 18 million shares to the Silicon Valley Community Foundation, a community organization that includes education in its list of grant-making areas. When questioned about the mid-2013 PRISM scandal at the TechCrunch Disrupt conference in September 2013, Zuckerberg stated that the U.S. government “blew it.” He further explained that the government performed poorly in regard to the protection of the freedoms of its citizens, the economy, and companies. In January 2017, Zuckerberg criticized Donald Trump’s executive order to severely limit immigrants and refugees from some countries. 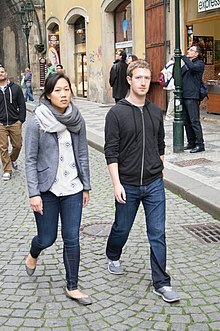 In September 2010, Zuckerberg invited Chan, by then a medical student at the University of California, San Francisco, to move into his rented Palo Alto house. Zuckerberg studied Mandarin in preparation for the couple’s visit to China in December 2010.On May 19, 2012, Zuckerberg and Chan married in Zuckerberg’s backyard in an event that also celebrated her graduation from medical school. On July 31, 2015, Zuckerberg announced that he and Chan were expecting a baby girl. He said he felt confident that the risk of miscarrying was low so far into the pregnancy, after Chan had already suffered three miscarriages. On December 1, Zuckerberg announced the birth of their daughter, Maxima Chan Zuckerberg (“Max”). The couple announced on their Chinese New Year video, published on February 6, 2016, that Maxima’s official Chinese name is Chen Mingyu (Chinese: 陈明宇). In March 2017, he announced that the two are expecting another daughter. Previous PostJeff Bezos" The Billionaire Shop Keeper"
Next PostAzim Premji"Indian business tycoon, investor, and philanthropist"